Originally, when Lotus opened up in North Delta, it was fairly well-received. And why wouldn't it be? 2 former chefs at Sun Sui Wah helped get this place running. You knew the food would be better than what most other places in the area could offer. However, not too long ago, it changed hands and I wanted to check it out for myself. 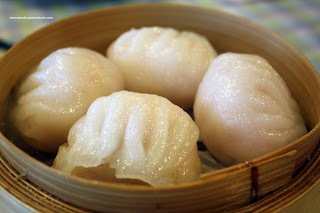 Driving past the place to and from work, I would take a peek at the $3.00 daily Dim Sum. A novel idea really. Dim Sum in North Delta? Other than Yummy Wonton House, there is no such thing here. Honestly, even if there was, it probably would not be very good. Today, it was the perfect opportunity since Hot Mama could join me for lunch. Normally, it's not the best idea to have Dim Sum alone. Sure, it's possible; but it severely limits the amount of dishes one could order. Last time I ate with Hot Mama, it was at Azia and she was adamant that we get Sweet & Sour Pork. Admittedly, she is not very adventurous when it comes to food. In fact, she had a hot pepper by mistake at Azia and came away quite traumatized. 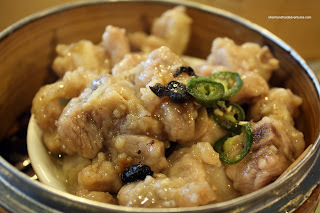 Seeing she had never tried Dim Sum before, I glowingly spoke of dumplings and spring rolls before I described chicken feet and tripe. Nervously, she s till joined me in my food adventure. When we did get down to ordering, I wanted a nice selection and I ended up with 7 dishes. The server suggested we wouldn't finish it. Either she thought we were light eaters or the portions could be large. Well, the dishes turned out to be quite large. We started with the staple of any Dim Sum lunch - Steamed Shrimp Dumplings. I wasn't expecting too much and these were actually quite good. Despite the outer wrapper being a bit thick and gummy, the shrimp inside were both plentiful and perfectly crunchy. It tasted quite good too with nice shrimp flavour and a hint of sesame oil. When I suggested we order Shrimp Spring Rolls, Hot Mama's face lit up since it was a familiar item. Well, these fried gems were really good. Hot, crunchy and full of shrimp, these delivered. What made me really happy was that they were served with Worcester sauce, not the "sweet 'n sour" we'd normally find out here in North Delta. 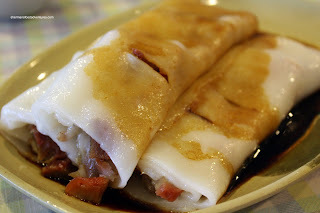 We also got the BBQ Pork Rice Noodle Roll. Personally, I love this dish despite the fact my parents instilled into me that BBQ pork is not worth a s much as shrimp. The significance? Well, I've been conditioned to order anything shrimp over pork especially if they're the same price due to "worthness". But honestly, I enjoy the BBQ pork version of this dish more since it tastes better. Sure shrimp has more texture; but it's a bit bland to me. This one was also acceptable. A bit stiffer than I would've liked, the noodle roll was packed with BBQ pork. You knew I had to do it. I had to order the Phoenix Talons AKA Chicken Feet. Despite its interesting appearance, Hot Mama stayed calm an d didn't seem fazed. Either she wasn't offended by them or she did a good job acting... Once again, another solid Dim Sum entry here. The chicken feet were in one whole piece and had that gelatinous texture right under the skin. It was steamed perfectly with no skin disintegrating. 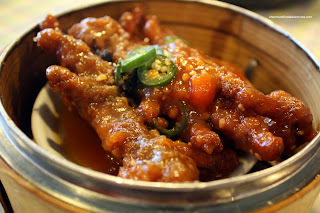 This is also an indication of freshness since bad prepared chicken feet are also an indication of re-steaming. As always, I got an order of the Steamed Black Bean Spareribs and yes, they were pretty decent as well. Soft, yet a bit chewy, meaty pieces of sparerib were flavoured nicely with blac k bean and garlic. 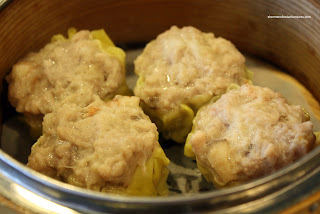 The first miss of the meal had to be the Sui Mai (steamed pork dumplings). They were pale looking and did not have a desirable texture. Usually, these are topped with some tobiko or salted duck egg for colour. Also, the meat is supposed to have some chewiness or bite. These one was too soft. 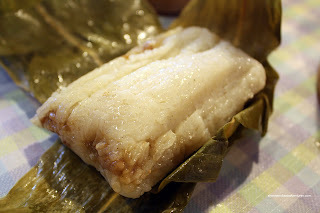 The last dish we got was the Sticky Rice wrapped in banana leaves. This was a fine way to end the meal since the rice was perfectly soft while still chewy and sticky. A good amount of ground pork helped provide texture and flavour. I love the Lotus! Sure, I don't really know what true or good dim sum would be, I do know I like the food here. Usually don't have to wait too long to get our food. The past few months I've been there almost once a week. Hot Mama should have tried the Deep fried slice roll. Tastes like a crispy doughnut when you dip it in the condensed milk. I always get one to share for desert. I do agree with the comment about staff. Last time I was there, they had only 7 tables filled with 3 staff and they were getting lineups at the door (was a Saturday, usually very quiet there. first lineup i've seen). I should actually say how horrible the place is and that it should never be visted, but I would be lying and only trying to keep the lotus to myself. nitroburn, you said it best. When something tastes good to you, no one can take that away from you. And the bottom line is that the Dim Sum at Lotus is good, especially where it's located too. 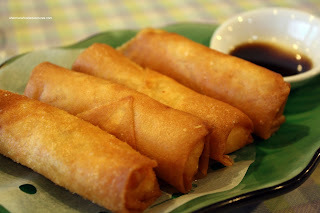 Haha, the deep fried bun/roll is a classic Shanghainese dish with the condensed milk. A fan favourite among many people! I'll definitely try the dinner items to see if it measures up too! I convinced the fiancé to have it for dinner, so we will be seeing what it is like this evening. Fingers crossed, but I do know the non-dim sum items I've tried have been great and anything has to be better then Rickshaw. Hopefully it is good as I have needed to find a better place to order "Chinese" food from that isn't too far. Only complaint, as before, would be the service. They are happy and great to talk to, but just a little inattentive. Thanks for such a great blog Sherman. This is one of the few I check almost every day for updates. You've helped me find a ton of new places to try and have found your reviews to be reliable. Thanks for the kind comments nitroburn. It is greatly appreciated. Please report back regarding dinner! I'm anxious to know! Really?!!? It was decent?!? It looks so bad!! And you photos look good....but the sticky rice looks very frozen. This is so Delta! I thought I had already replied, so sorry for the delay! I don't have much to compare it with, but the take-out Chinese was good. I wasn't shouting from the rooftops it was the best I've had, but I would definitely order again. Other experiences with Chinese food in Surrey has been bad. The Rickshaw somehow gets voted #1 in the surrey paper, but the food is just sooooooo greasy I can't bring myself to eat much of it. 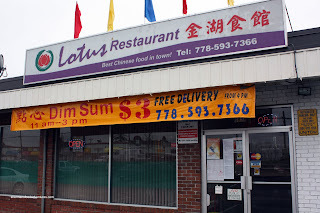 I would compare the Lotus to On Yuen in Surrey. "Follow Me Foodie": It was great to us who rarely get to eat even moderately good Chinese food that doesn't come with a pound of free grease. I know plenty of people who have been pleased with this place and go back at least a few times a month.